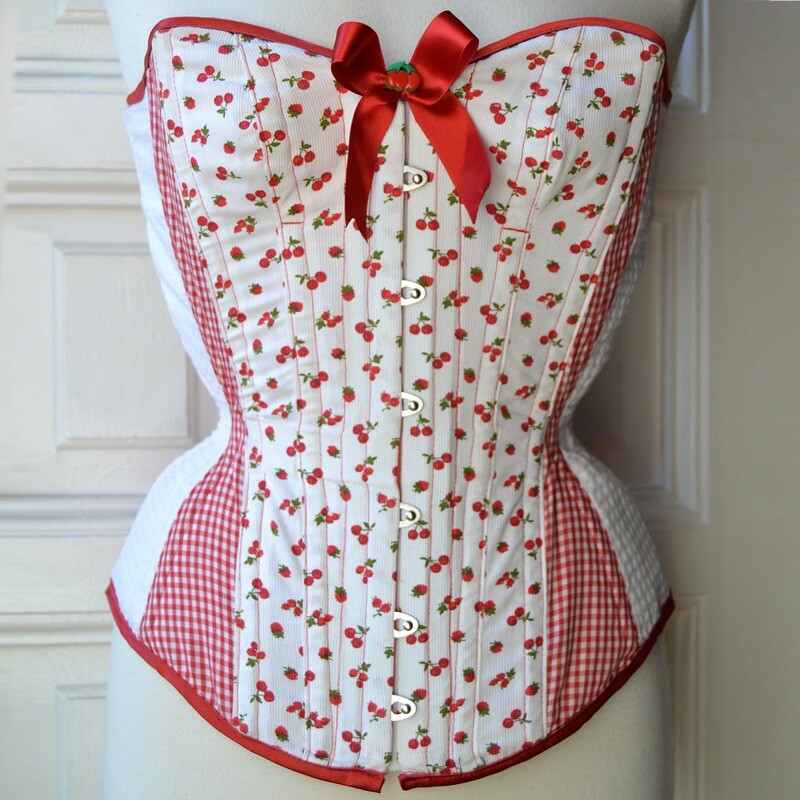 Rockabilly style cherries, gingham and pique overbust corset. Fully lined, steel boned and reinforced, features front busk and back lacing. Attention! This sample item has been made to the measurements indicated in product details. Please, read all the information. Let's feel like a pin-up girl with this rockabilly style overbust corset. We used cherry print and gingham fabric in red and white for a classic feel. Fully lined, reinforced and steelboned, this corset archieves a stunning shape. Sweetheart neckline, medium hip cut and straight back, all make the corset quite comfortable. Keep in mind that its reduction is very intense though. Features front busk, detachable modesty panel, back lacing and a cute hand sewn bow with a cherry button. This corset is a sample design for photography, conserved with care. It is made according to the specific measurements in product details. It is suitable for you if your measurements and bust cup size fit into the ranges indicated in the drop-down menus. If you are not sure if the corset will look good on you or if you have any other question, please, do not hesitate to contact us before shopping!